Raising contented children in a consumer driven world is a challenge for any parent. 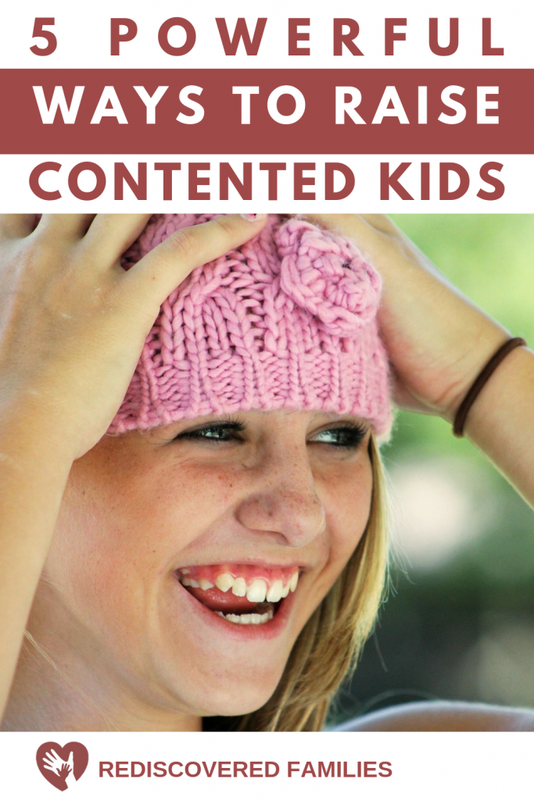 Here are 5 powerful strategies to help you raise contented children. Can you imagine what your family life would be like if everyone was happy with what they had in the moment? Where no one was wishing for something else? It sounds wonderful to me. In our consumer driven culture cultivating contentment can be hard at times. Still I have discovered it is possible and I believe you can raise contented children. I would like to suggest five simple ways to help you nurture a culture of contentment in your family. 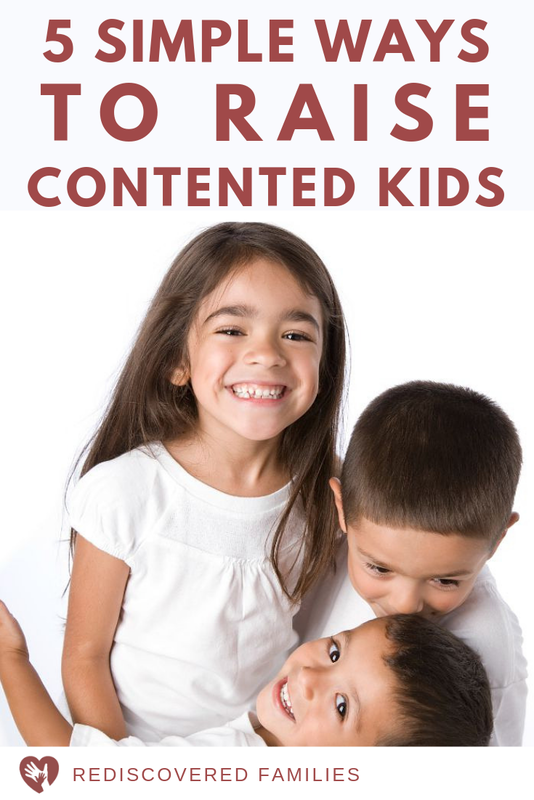 5 strategies to for raising contented children. Children do as they see, not as they’re told. 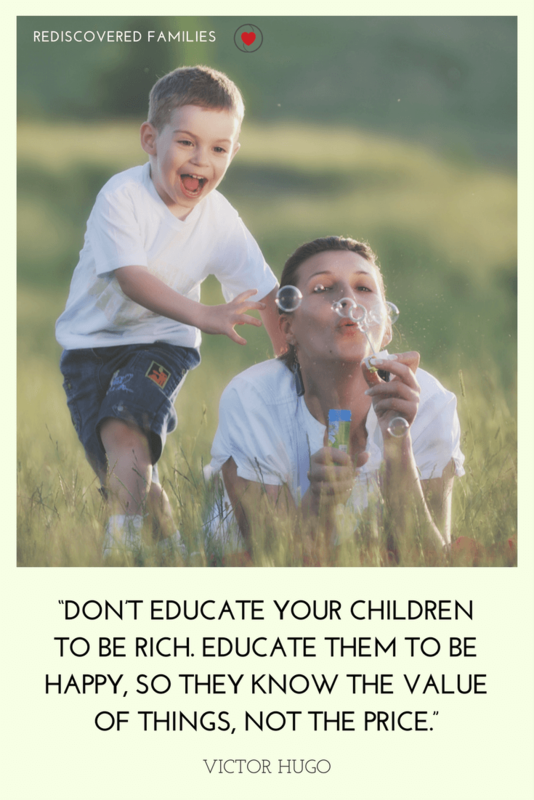 If your children see that you are content with what you have, then they probably will be too. I did not grow up in a home where there was a lot of money, but strangely enough I didn’t realize that until I was an adult! I never went without. I’m sure that my parents struggled with feelings of discontentment from time to time, but for the most part they were grateful for what they had. As a consequence it never occurred to me that we needed anything else. 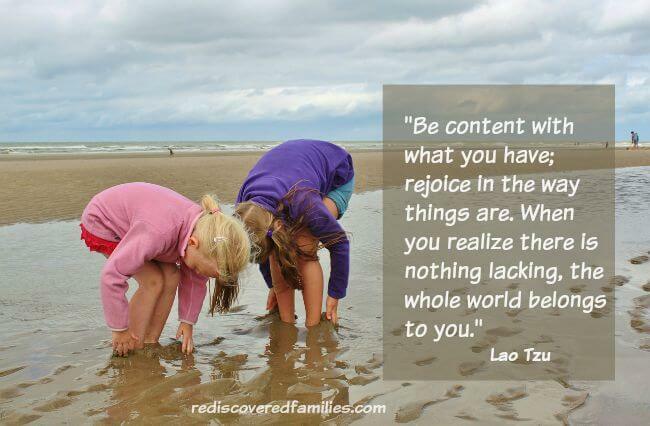 Let your children see you practicing the quality of contentment. It is a powerful example. What to know more? Here’s a helpful article about finding peace and contentment from Tiny Buddha. Gratitude has a way of cultivating contentment, because it encourages us to notice all the good things in our life. It helps us look at things in a positive light. I have discovered that it is really hard to be discontent when we are practicing genuine gratitude. One of the most important things you can do is to offer gratitude in a variety of forms when your kids are within earshot. Give thanks for the material blessing you enjoy, for the beauty of the nature, and for the things in your life that bring you joy. Be sure to express gratitude for your family as well. Do this often! Have each member mention the thing they are grateful for at the dinner table. Name daily blessings as part of your prayers. Keep a family gratitude journal and update it daily/weekly. Generally speaking families who help others begin to realize how little others have and how much they have to give. Your help could be monetary, such as making a Kiva loan or donating to your favorite charity. Don’t forget that giving time and energy also has a huge impact. Look for ways your family can interact directly with the people they’re helping. As your children share their talents and time they will develop a greater appreciation for what they have and for what they can offer. For inspiration check out my Acts of Kindness posts. 4. Limit Your Family’s Exposure to Commercials. Every year manufacturers spend billions of dollars on advertising. Their aim is to nurture your feelings of discontent and persuade you that their product can make you happy…. for a small price. It’s all nonsense of course. Stuff never equals happiness. Yet somehow these advertisements convince thousands of people to part with their hard earned cash for things they really don’t need. Corporations are targeting your family and their weapons of choice are commercials. Advertising agencies compete for the opportunity to nurture discontent and promote desire in your family. Download and install Adblock Plus. This handy little app blocks advertisements on websites, Facebook, and even Youtube and it works really well. I love it! Unplug from cable television. That doesn’t mean you have to go without any television. We have been unplugged from cable for several years now, but we subscribe to Netflix and borrow DVD’s from the library instead. Be aware that many DVDs now contain commercials. If you really don’t want to unplug that cable try muting the television during the commercials, or record the shows and fast forward through those annoying commercial breaks. Subscribe to children’s magazines that have little or no advertising. Contact your mail carrier and make arrangements to stop the delivery of flyers. Try limiting your family’s exposure to commercials for one month and see what happens. You may be surprised at the impact this one action will have. This is a really tough one, particularly if you have teens that live on social media. The trouble with social media is that it encourages us to play the comparison game. When friends post pictures of their latest purchase, or amazing social life, and get a ton of likes it sends a subtle message. In order to be somebody you need to have these things too. Start talking about some of these issues with your children. Have some discussions about the dangers of comparing our lives with others. Talk about the concept of happiness and the dangers of “when and then” thinking. When I get X then I will be happy. Share some of the struggles you have in this area and what tools you use to break free from the comparison habit. For a really great read on the subject I would encourage you hop on over to Becoming Minimalist and read A Helpful Guide To Stop Comparing Yourself to Others. I’d love to hear your thoughts on this topic. Are you intentionally nurturing a culture of contentment in your family? Which one of the above practices could you implement today? Do you have any other suggestions? Please share in the comments below! This can be difficult to achieve in our modern society. There are some good tips here to think about. This is great advice! All of these things went on in my childhood home, so I tend to do them kind of automatically, and I think it’s good for my kids as it was good for me. A sixth tool I’d add is imaginative repurposing–you don’t feel as much need for new toys when you’ve grown up seeing your parents make neat things for you out of an empty nut canister and a bottle cap, etc. #5 is one area where I think my family could use some work. My parents tend to buck the comparison game by playing it differently: comparing our family’s values with those of more consumerist families and believing that our way is better. Well, it is, usually, but feeling superior to others because of what you choose not to have isn’t really moral high ground, and it creates problems when you truly do want something that will make your life better but you feel guilty about being one of those consumer-people…. Becca @ The Earthlings Handbook recently posted…Pen and Marker Recycling: Starting Year 3! It is wonderful to grow up in the kind of home you describe. I do like the idea of imaginative repurposing. That was something my brothers and I did quite a lot when we were growing up. I remember making dolls houses and puppet theaters out of cardboard boxes. I found your comment about playing the comparison game differently. I guess comparison is the thief of joy no matter which way you do it! Thank you for taking the time to write such a wonderful and thoughtful comment. These are such great tips on a fantastic topic! I really enjoyed reading this. It is so hard to teach contentment, let alone live it yourself, in this world today. There’s always something new and shiny and the ads make you feel like you NEED it. These tips will be very helpful with my young impressionable daughter. THANKS! You are right about the new and shiny things Deanna. I think learning to be content is a journey and sometimes it takes a while to get there. That last one is so true. Comparison only leads to feeling terrible!